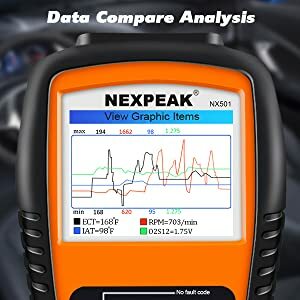 The NEXPEAK NX501 OBD2 Scanner is an Enhanced model car computer fault code reader designed for Engine system, featuring FULL 10 OBDII Modes diagnostic function in check all engine related trouble codes from Vehicle ECU (Electronic Control Unit), such as Emission Control, Oxygen (O2) Senor, Evaporative Emission Canister Purge Valve (EVAP) etc. 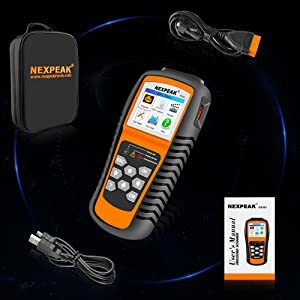 The NX501 OBDII code reader will read the faults which caused the check engine light comes on and tells you what’s wrong, it will guides you through fixing your car, erase trouble codes and turn off check engine light. 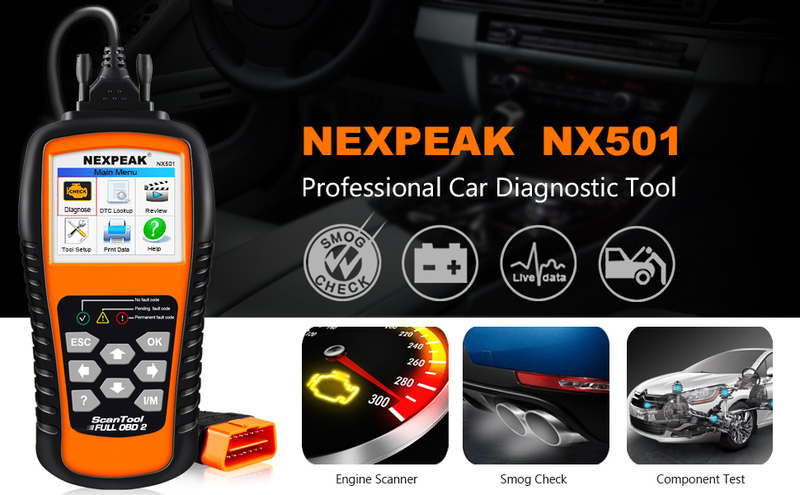 Also, NEXPEAK NX501 car diagnostic tool will help you to know what the real problem is before taking the car to workshops, avoid blind maintenance. Pull engine related Generic and Manufacture specific, and pending trouble codes. One-click hotkey to read emission status, erase fault codes. Turns off Malfunction Indicator Lamp (MIL), resets monitors. Displays the Diagnostic Trouble Codes (DTC) definition on screen directly after reading. Reads stored freeze frame data such as Vehicle Speed, Air Flow, Fuel Trim, and Engine Coolant Temp etc. Reads and displays live sensor readings in text or graphs forms, supports unique 4 parameters compare in real time. EVAP Test for Fuel Tank System (Mode 8) and Advanced On-board Monitoring (Component Test), Oxygen Sensor Test. Retrieve Vehicle Information such as VIN (vehicle identification number), CID etc. Upload recorded data to computer and print out, data editable before printing, be your own mechanic. Life-time Free device ONE-CLICK SMART updatable and upgradable service. Battery Voltage Check and reminds you of battery aging or alternator malfunctions. 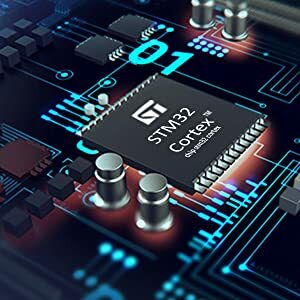 Excellent Performance: The NX501 code reader's diagnostic speed is 2-3 times faster than other obd2 scanner with newest optimization algorithm in industry, user-friendly diagnostic interface and best STM-32 main chip set, read the results in seconds and quickly understand what’s happening to your car. 4 graphic live data are displayed in a time-based chart to help customers to better analyze the abnormal sensor parameter. O2 Sensor Test –accurately identifies failures of Oxygen sensor and vehicle emissions related errors. On-Board Monitor Test – This function can be utilized to read the results of on-board diagnostic monitoring tests for specific components. Check the emission status anytime and anywhere, Have Your Vehicle Inspected before the Annual Emissions Test (SMOG Check). <10.8V Before Starting- Too Low, change battery, or may be unable to start. 10.8V-11.8V Before Starting- Slightly Low, difficult to start, please turn off other electronics and start to charge. 12.8V-13.2V After Starting- Too Low, might be unable to charge the battery, please check other electrical load. >14.8V After Starting- Too High, may damage the battery, please check the engine stabilizer. *Readings may have ± 0.1 V deviation. 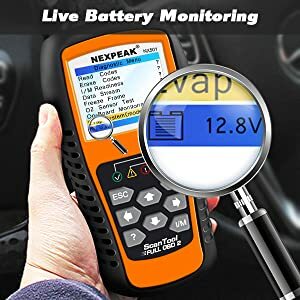 1) Innovative 2.8’’ colorful LCD screen OBD2 Scanner: perform the full engine diagnosis and battery analysis for your car. 2) Portable Nylon Carry Case: easily carry /store the NX501 car diagnostic scanner. 3) User's Manual: detailed instruction with step by step guidelines. 4) Extra Long 5ft OBDII Diagnostic Cable: allows you to freely diagnose even out of vehicle. 5) USB cable: for upload data to computer and update the obd2 scanner.